All the practical information you need to know about Mountain Arm campground. 1.5km south of Laguna, take Yango Creek Road for 2.2km to the intersection with Upper Yango Creek Road. Turn left onto Upper Yango Creek Road and travel for 2.6km to the intersection with the Finchley track. Turn right uphill and follow the road for 9.2km to the Yango track intersection, just past Finchley lookout. Veer right onto Yango track and follow it for 13km then turn left onto Big Yango Entrance Road, where you will find a gate (pin/combination number required). From the gate, travel a further 5km towards Big Yango House. Go past the house and the pine trees and follow the road for 3km to the campground. There is only one main gate into the Big Yango precinct and another one into Nowllands trail. Both have combination locks. Other gates such as at Tumbledown, Spring Arm Link, Yango walk and the Yokey trail/Rascally intersection are locked to prevent damage to environmentally sensitive areas, cultural sites or the Yengo Wilderness Area. If you would like to access Nowllands trail and Rileys Paddock, please contact the Bulga office for separate pin/combination numbers. Campsites are unmarked so there is plenty of parking. Maximum 3 vehicles per booking. There are lots of great things waiting for you in Yengo National Park. Here are some of the highlights. Try mountain bike-riding around the Mount Yengo loop trail. Set up camp at either Blue Gums or Mountain Arm campground and enjoy the stunning spring wildflower display. Great for 4WD touring, experience those amazing sunsets and spectacular views from Finchley lookout. Make Big Yango House your base to explore the park, enjoy warm days on the verandah and chilly nights by the fireplace. The campground accommodates up to 36 campers and is suitable for groups. 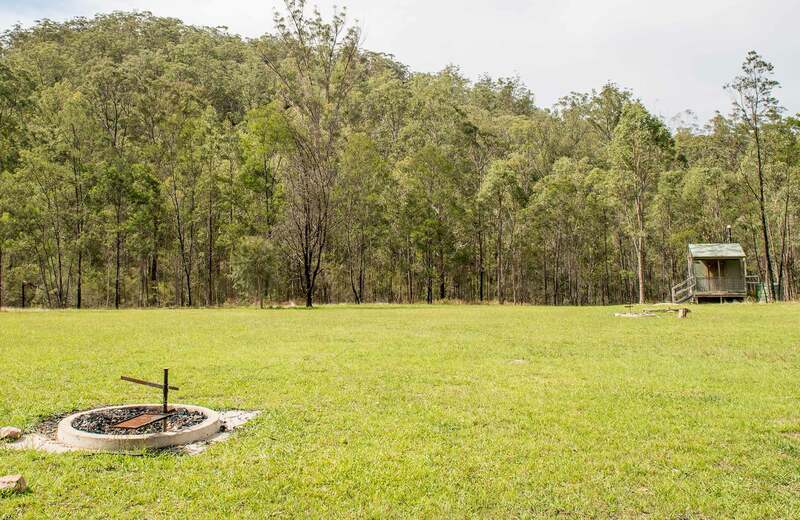 Campsites are unmarked and suitable for off-road caravans, camper trailers, 4WD campervans and tents. Water isn't available at this campground, so you'll need to bring your own supply. Firewood is not provided and may not be collected from the park. You’ll need to bring your own supply. Rubbish bins are not available. Please take your rubbish with you. Please don't burn any rubbish in the fire rings. There is no power available in the campground. Camping is also available at Blue Gums campground, or you may prefer to stay at Big Yango House. Horses are permitted in the Big Yango precinct, but are limited to the valley floors and set trails. You can only house your horses at the yards near Big Yango House or the yards at Blue Gums campground. The yards are not maintained and use of the yards is at your own risk. For more information contact the Bulga office. An emergency phone is available down at the bottom shed below Big Yango House. You can only make emergency Triple Zero (000) calls or reverse charge calls. Whether you're pitching your tent on the coast or up on the mountains, there are many things to consider when camping in NSW national parks. Find out how to stay safe when camping. During periods of fire weather, the Commissioner of the NSW Rural Fire Service may declare a total fire ban for particular NSW fire areas, or statewide. Learn more about total fire bans and fire safety. In the event of a bushfire, proceed to Big Yango House and the slashed grassed areas, and remain there until emergency services arrive. Report fire by phoning Triple Zero (000) from the emergency phone located outside the bottom shed. Depending on your carrier, some reception may be available at the main gate accessing the property, at the top of the hill above the main gate, or on several high ridges that the 4WD trails run along. Mountain Arm campground is not wheelchair-accessible. Generators are permitted as long as due consideration is given to other visitors. Generators may be used between 10am and 8pm. Horses are permitted in the Big Yango precinct, but are limited to the valley floors and set trails. Unregistered vehicles such as trail bikes, mini bikes or quad bikes are not permitted. Flying recreational drones is prohibited in this area. See the Civil Aviation Safety Authority (CASA) guidelines and read the OEH Drones in Parks policy for more information. Firewood may not be collected from the park. You’ll need to bring your own supply.